Exactly a week ago on an easy breezy Sunday morning, my friend HC and I had breakfast at Torch Restaurant in Connecticut Street, Greenhills. Having been a frequent customer of Torch, HC recommended that we try their new menu, which includes a new set of breakfast items. I enjoyed my first ever Sunday breakfast with friends late last year, so I thought having another one would be a great idea. And so we decided to meet at 9AM. I didn't have any problems finding Torch Restaurant even if I was not familiar with the street. It is basically tucked on the left side of Connecticut Street heading towards EDSA. Although there were few parking spaces outside the restaurant (across the street), I decided to park my car at the basement of the furniture store beside it for a minimal fee of Php35. The restaurant has a very attractive sign board and a spacious, inviting entrance. When I saw HC coming out of the parking, we immediately entered Torch. I was excited to see how the place looks like inside and if the food will be worth the early morning rise. In fairness, the place looks so sanitized and well organized. The simple white tables and black chairs were stationed far away from each other, giving enough space for diners to move around. The interiors are pretty simple and straight forward, but I like how they used those green sticks to diversify the look and colors of the restaurant. Behind the green sticks are more tables and chairs, and a long couch for those who wanted softer cushion. There's also a plasma television, which they turn on when there are customers on this side of the resto. Beside the bar is an open kitchen window, where once would see how the chefs prepare the food. As a diner, I usually feel more secured that the food being cooked is clean and orderly whenever I see such kitchens. There's sort of transparency between the restaurant and the customer. Do you also feel the same? Well anyway, enough of the structure and on to the food tasting. First on our order list is their Salpicao Tenders (Php219.95). An order comes with sauteed US Angus beef tenderloin cubes mixed with mushrooms and served with egg, buttered garlic rice, sweet-sour picked veggies (atsara), and tomatoes. I like it, because the meat is very tender and juicy. The mixture of garlic, salt, pepper and other seasoning are just right as well. This dish is a good choice if you want to do away with the usual breakfast meals we see in other food chains. Torch Restaurant serves breakfast menu from 7:00AM to 10:30AM everyday, which comes with complimentary bottomless house blend coffee. Hurray for coffee lovers! Other main breakfast items that come with egg and garlic rice are the following: Fisher's Bangus (Php165.95), Homemade Corned Beef (Php189.95), Longganisa Kebab (Php165.95), Sardines (Php175.95), Torched Hamonado (Php155.95), Tocino Fingers (Php172.95), and US Angus Beef Tapa (Php186.95). Next on the table is the Hot Italian Omelette (Php169.95). Surprise! It was a cook-our-own omelette. It comes with a hot plate, egg mixture, salt and pepper. I think it's a great idea to have customers cook their omelette, since we have different preferences - some like it well cooked, while other want it a bit wet. Plus we get to control the level of pepper and salt for taste. The egg mixture consists of sauteed Lugo Nigi sausage in spiced arrabiatta cream with onions, red/green bell peppers and tomatoes, topped with melted cheddar cheese. Man, I love this omelette! The bell pepper has a prominent taste in this dish, but I was still able to savor the tender and juicy sausage included in the mixture. Pairing the bread (pandesal) with the omelette gets two thumbs up from me. There are other omelettes that I would love to try next time. These are Bacon Temptation Omelette (Php179.95), Cheese Omelette (Php169.95), Fresh Garden Omelette (Php159.95), Porky Pig Omelette (Php169.95), Shrimp Omelette (Php189.95), and Steak Omelette (Php189.95). The third item we tried out is the Hush Puppies (Php185.95/10pcs, Php99.95/5pcs). These delicious bite-sized Danish buttermilk pancakes are rolled in a yummy cinnamon sugar mixture, and served with rosemary maple syrup. The balls are moist and the cinnamon-maple syrup combination really tasted great! An order is good for sharing and can either be a dessert or an appetizer. Apart from those that we've tried, there are still a lot of items that I want to taste next time. Being a Fusion restaurant, Torch offers a wide variety of choices from appetizers, soup, meat and seafood items to pasta, pizza, different sushi, desserts, and more. And I heard that Torch Restaurant transforms into a bar from 10PM onwards. Coolio! Give Torch Restaurant a try! I do hope you'd also find your comfort food here. 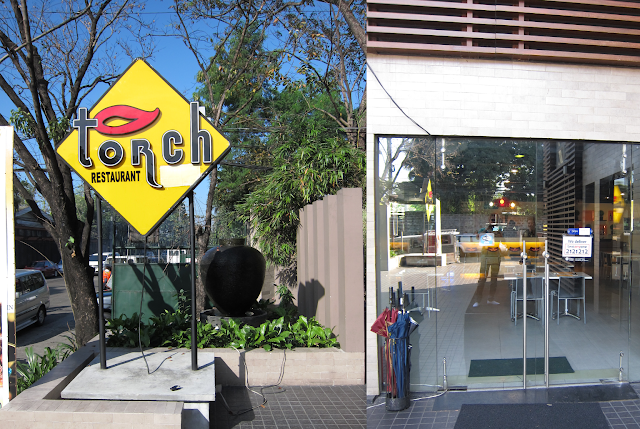 Feel free to like TORCH on Facebook or follow them on Twitter, so you'd see updates and pictures of their new menu. Open everyday for Breakfast, Lunch, Dinner and After Dinner from 7AM onwards. They also do Catering Services. Kakagutom. And the place looks really cozy. looks like a great find:) want to try the omelette too! Now I'm hungry! Where to find this restaurant in that country! I thought I was looking at a posh discount furniture los angeles but no, is that in the Philippines, for real?